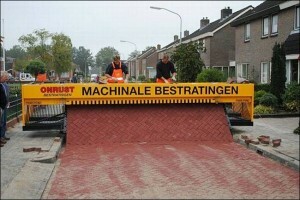 A machine that lays an instant brick paved road! A friend e-mailed me pictures of this amazing machine that is used in Holland to speed up the laying of brick paved roads. It is an impressive machine and a sensible idea. The manufacturers say that it can lay more paved road per worker than the traditional method, while reducing the amount of back braking work involved. 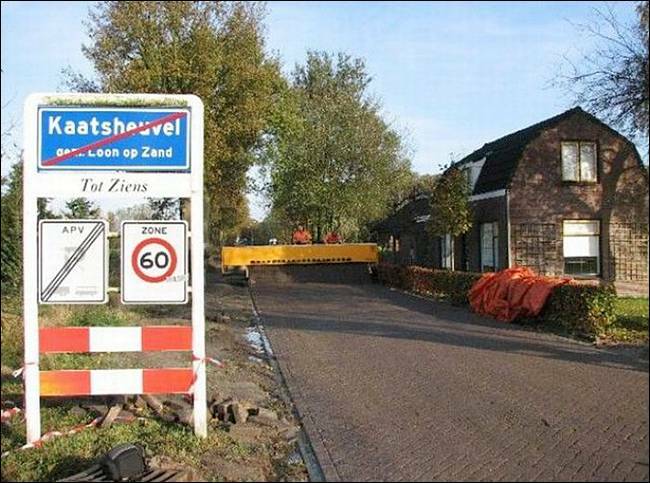 They estimate it will lay 300 square meters of paved road a day. 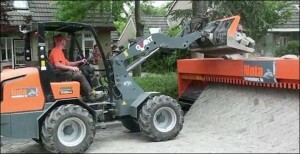 The machine is called the ‘Tiger Stone’ and it is a good example of someone ‘thinking outside the box’. 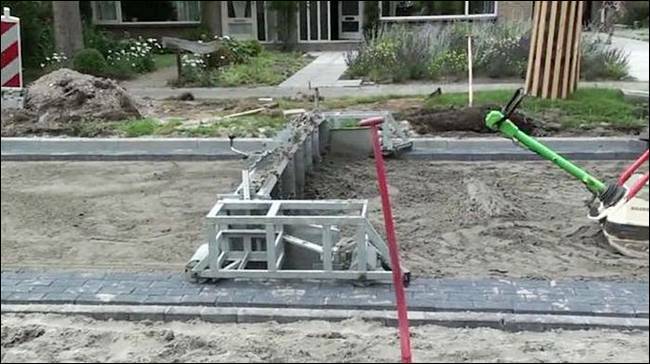 The machine works by operatives taking bricks from a trough on top of the machine and positioning the bricks into the selected pattern at the top of a sloped plate. As the machine moves forward along the prepared sub-base, the bricks slide into their final position by gravity. 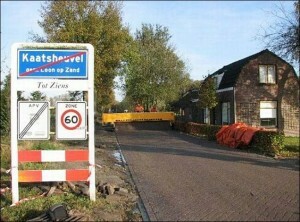 I presume the gaps between the bricks are filled with sand afterwards and the road lightly compacted. 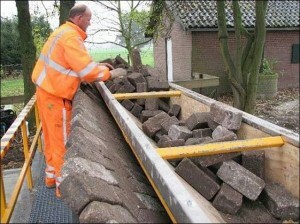 The bricks are feed into the machine by a low loader. 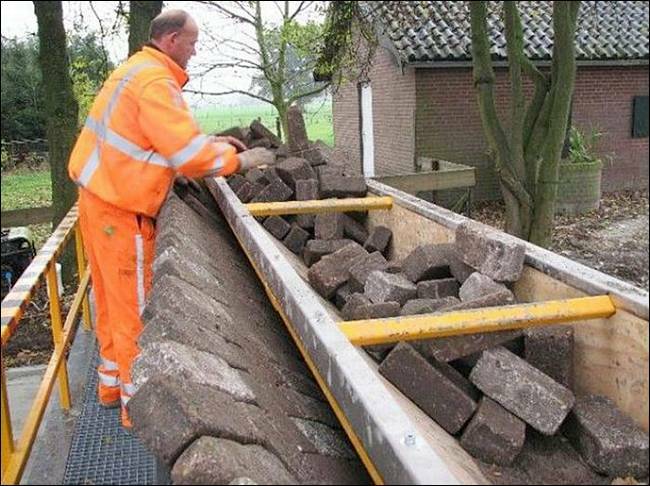 That is one area where there may be some room for improvement, as the bricks may get chipped when being dropped from the low loader, and there is also a risk of the loader hitting the workers or machine. Perhaps a type of magazine or conveyor brick feed system would be better? See photographs below. It was only a matter of time I guess. I recall in ’78, Chapman Rd. Hackham , was kerbed by a private company at the (possible) rate of 2 km. a day, using a machine. The machine excreted the concrete in a high viscous mix, through an end elevated kerbing profile chute. I noticed a week or so ago it is all still holding up well, despite a council chap telling me that the council do it “properly” & that the system had many faults & the kerbing would have a short life span. Sadly, I can’t recall how the machine handled driveway entrances. 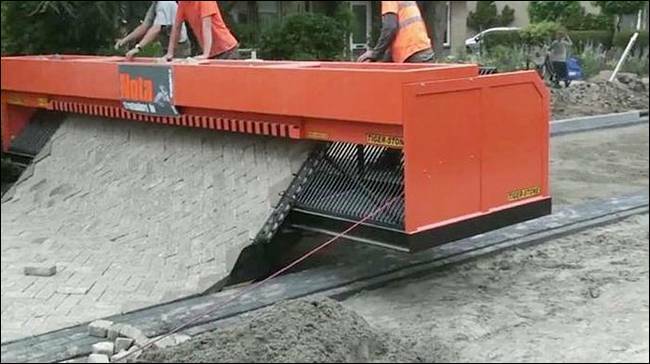 we have kurbing machines in the U.S. and when they come to a driveway they make the flow of cement taper off and float the kurb by hand with a trowel. The kurbs do last very long and even when hit by the occasional auto they survive the impact. Much faster than totallly by hand. Good idea. There is a similar system for forming a concrete safety barrier on the central median of motorways, or highways as you would call them. I would like know about machie and manufacturers. pls quote the prices of brick lying machine no. 1 ? Does anyone know the cost to rent or by one of these? As good an idea as this is, this machine has never been seen on US shores. I finally have a job that might benefit from this and now, I cannot find the machine to save my life, well, I could buy one and import it…….